Silent Night patches use this knowledge to stimulate acupuncture points on the body for improving the flow of energy and producing drug-free sleep. We spend about 8 hours per day, 56 hours per week, 240 hours per month and 2,920 hours per year (one-third of our lives) SLEEPING. Sleep studies show that insufficient sleep affects up to 70 million people in the United States. This costs about $100 billion each year in accidents, medical bills and lost work. (Statistic from Brain Facts, Society for Neuroscience, 2002). Sleep patterns change as people age. 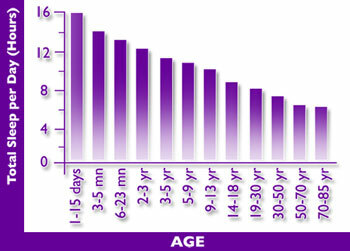 As shown in the graph above, infants spend more time sleeping compared with the times of older children and adults. What if there was a way to improve the quality of your sleep, without having to swallow pills or take drugs. Now you can with LifeWave. Our exclusive non-transdermal patch system utilizes new technology to gently stimulate acupuncture points – literally improving the flow of energy in the body – for clinically tested improvement in the quality of your sleep, the very first evening of use. We are all accustomed to thinking that we have to put something into our body (like vitamins) to improve our health. While proper nutrition, water and exercise are a necessary part of any healthy lifestyle, our bodies also require a continuous flow of energy. For example, our brains and nerves transmit electrical signals to our muscles to cause them to use stored chemical energy to contract. It’s been known for generations that specific frequencies of light can cause specific changes within the human body. When we go out in the sun, a frequency of light causes our body to make Vitamin D. Another frequency of light (UV) will cause our body to make melanin, the chemical that gives us a sun tan. Silent Night patches use this knowledge to stimulate acupuncture points on the body for improving the flow of energy and producing drug-free sleep within the first evening of use. Acupuncture is a type of Oriental healing art based on ancient Eastern medicine. A practitioner will typically stimulate acupuncture points on the body with needles or pressure to improve sleep, relieve pain and discomfort, and promote good health. The self-adhesive Silent Night patches utilize the principles of Oriental medicine and needleless acupuncture to gently stimulate points on the body that have been used to balance and improve the flow of energy in the human body for thousands of years. The result is a natural way of improving the quality of your life without any drugs, stimulants or needles entering the body. Synopsis:This video is an introduction to what the Silent Nights patches are and how they interact with the human sleep cycle.Several acupuncture points are suggested to maximize the health benefits of the patches and improve sleep. 1.- How does the Silent Nights patch work if nothing enters the body? This is a non-transdermal patch with a new technology that gently stimulates acupuncture points to improve the body’s energy flow for improving the quality of sleep. This is similar to the way that sunlight can increase your bodies levels of Vitamin D. No supplements, stimulants or needles are used. Do not use more than one patch at a time. Yes, research has shown that the Silent Night patches improve the quality of sleep the very first evening of use. It is recommended that you wear a patch no more than 12 hours per evening. Do not reuse the patches. 7.- Can anyone use Silent Nights? If you have a health condition or are in doubt please consult your physician before using Silent Nights. Do not use if you are pregnant or nursing. 8.- How important is a good night’s sleep? Studies show that insufficient sleep affects up to 70 million people in the United States alone. Sleep deprivation may cause accidents, lost work and a decline in general health. 9. – What will I feel when wearing Silent Nights? This is a non-transdermal patch with a new technology that gently stimulates acupuncture points to improve the body’s energy flow for improving the quality of sleep. Upon waking in the morning, you should feel rested and refreshed. No drugs, supplements, stimulants or needles are used. 10. – Are there any drugs or stimulants in the patches that are entering the body? No. LifeWave patches do not contain any harmful drugs stimulants. The patches are designed to apply a mild and temporary pressure to acupuncture points that are known to improve the flow of energy through the body. No magnets or needles are used. 11. – Can I wear the Silent Nights Patch with other LifeWave patches? Do not wear the Silent Nights patch with any other LifeWave patches. For adult use only. Intended for users 18 years of age and above only. Ask a health professional before using if pregnant or if you have a health condition. The statements herein have not been evaluated by the Food and Drug Administration. We certify that all LifeWave™ patches are manufactured at FDA registered facilities and in accordance with the specifications in their patent filing. Neither LifeWave™, LLC nor the Nanotechnology store, endorse claims or have scientific proof that it’s products are effective in the cure, mitigation, treatment or prevention of disease in man or animal.